Who Invented the Floppy Disk? - Who Invented? / COMPUTING / Who Invented the Floppy Disk? David Noble – The ‘floppy disk’ was invented by David Nobel working for IBM in 1967. The first floppy disk was invented by a team of researchers at IBM. The team was headed by Alan Shugart and the main designer in the team was David Noble. The professionals at IBM wanted to create a device which could store information to load microcode into the System/370 computers and for releasing software updates to customers. 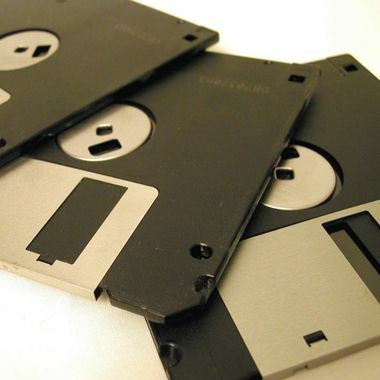 These floppy disks were known as ‘memory disks’ in the beginning. The first floppy disk was 8” in diameter, it was a read-only disk which held 80 kilobytes of data and was made of a flexible plastic material, hence the term ‘floppy disk’. They were released commercially by IBM in 1971. Over the next few decades the floppy disk went through a number of improvements as it slowly got smaller in size, increased its’ data storage capacity and changed in flexibility thus making it more reliable and robust for data storage. So the 5 ¼” disk was first released in 1976 initially storing 95.8KB of data but later increasing that to 110KB. Up to this point the disks were only single-sided. A double-sided version was developed in 1978 known as the ‘double-density’ disk because it doubled the storage capacity to 360KB. By the 1980’s the 3 ½” floppy disk was in use, first produced by Sony but quickly followed by other companies with slight variations. It had an initial capacity of 360KB but again quickly developing into double-sided, double-density 720KB versions. In 1987 a High-density (HD) format was created which enabled storage of 1.44MB (megabytes), significantly more storage than any previous disk. The computers on the market in the 1980s had both 5 ¼” and 3 ½” disk drives but by the 1990s only 3 ½” drives were included. The invention of the Floppy Disk should be credited to the inventors listed on the Floppy Disk drive and Floppy Disk patents. IBM Direct Access Storage Product Manager, Alan Shugart, assigned the job to David L. Noble, who tried to develop a new-style tape for the purpose, but without success. The project was reassigned to Donald L. Wartner, 23FD Disk Drive manager, and Herbert E. Thompson, 23FD Disk manager, along with design engineers Warren L. Dalziel, Jay Brent Nilson, and Ralph Flores; and that team developed the IBM 23FD Floppy Disk Drive System ( nick named the Minnow). The Floppy Disk, a read-only, 8-inch-diameter (200 mm) flexible diskette they called the “memory disk”, holding 80 kilobytes of data. The Invention patent was issued to IBM in 1972. The Floppy Disk Drive Patent # 3,678,481, Inventors Warren L. Dalziel, Jay. B. Nilson, and Donald L. Wartner, was issued July 18, 1972. The Floppy Disk Patent # 3,668,658, Inventors Ralph Flores and Herbert E. Thompson, was issued on June 6, 1972.